Media Hub - Photo Comp 2016 Winners. Wow! What an amazing response we had to this year's photo competition. We had well over 600 images entered but it's not just about quantity. The quality of the entries we had this year was probably the best ever. So many amazing pictures made the judging process very difficult. This year we did things a bit differently. Rather than having three runners up we had three different categories; the best aesthetic photo, the best photographic skill and the best use of equipment/prop. We also had the usual grand prize winner. The best aesthetic image was judged purely on the beauty of the image. 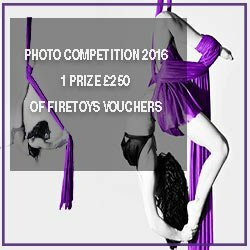 Judging this category were two photographers, who are also circus enthusiasts, a professional fire performer and the head honcho here at Firetoys. This was an extremely close run prize with a hair's breadth separating the top few images. In the end it was Shey Smithson, aka Sheynanigans, a hoop performer from Bald Rock, CA, USA, who took the crown. This image showed great depth of field and we loved the beautiful body shape, position of the hoop and the back lighting by the low sun. Next up is the best use of equipment or prop category. In this category we were looking for both technical skill with the equipment and interesting or unique ways in which it was used. The judges on the panel for this prize were three aerialists, one of whom is also a skilled hula hooper and another a photographer, and a professional fire performer. This category had many great pictures to choose from but there was only one entrant who was pulling off a great move 3km in the air. Anna Cochrane was the clear winner in this category. You can find out more about the story behind this image by clicking here. Last but by no means least of our runners up categories is the best photographic skill prize. As the name suggests, we were looking at the technical skill shown by the photographer. This category was judged by three professional photographers. This category was also very close but in the end Rob Bates of Rob Bates Photography won with this superb light-painting image made using a PixelWhip and a long exposure. For the overall winner of this year's photo competition we were looking for an image that combined all the qualities we were looking for in the runners up prizes; aesthetics, the performer's skill and the photographers skill. The overall winner was voted on by the entire Firetoys staff and included all the expert judges who voted on the other categories. As you might imagine, given the quality of our runners up, choosing the overall winner was a close and exciting process. The leader changed with almost every vote with the final vote determining who won the grand prize of £250 in Firetoys vouchers. When the dust settled it was Norbi Whitney with this photo of Ashleigh Pearce that won the day. We loved everything about this image; the composition, the gorgeous lighting and the shadows it creates, the autumnal atmosphere of the photo, the technicality of Ashleigh's handstand and the muscles working on her back. It's an all-round exquisite photograph. If you'd like to see a selection of great entries that didn't win head over to this gallery.